Glenn Omatsu. Photo by J.K. Yamamoto/Rafu Shimpo. Early struggles in life can foster a sense of humility, gratitude and growth. From these lessons come the compassion, ability and passion to pay it forward in the hopes of helping someone else. This philosophy governs much of what California State University, Northridge faculty member Glenn Omatsu does. His efforts were recognized last month at the Cherry Blossom Festival of Southern California, where Omatsu received the George Kiriyama Educational Excellence Award. The award recognizes a K–12 or higher education educator who exemplifies the work of the late George Kiriyama. 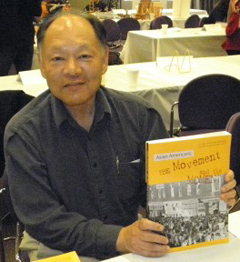 Kiriyama spent his educational career creating multicultural materials, training teachers and administrators on the Asian American experience and the Japanese American WWII incarceration, and mentoring and promoting leadership. Sandra Stanley, Asian American studies chair, said she is not surprised that Omatsu is receiving recognition for his work. In addition to working in Asian American Studies and with CSUN’s EOP, Omatsu also serves as the Bridge Academic Liaison for EOP. He is the College of Humanities’ peer mentor program coordinator and assists with “Building Connections for Success” and mentor training for faculty and peer mentors. He also teaches classes at Pasadena City College and UCLA. “To be a master teacher does not mean that he presents himself as the dominant voice in his class, instead he works to create a community of professionals that he treats with respect. Professor Omatsu is strongly committed to these students and the peer mentoring process, advancing the goals of a learning-centered university,” she said. Omatsu said that he’s passionate about teaching and mentoring at CSUN. “It gives me the opportunity to interact with wonderful people, especially students, but also the opportunity to practice my anti-colonial and community-based approach to mentoring. “The late George Kiriyama embodied great mentoring qualities. His compassion and his commitment to multiracial justice continue to reverberate in Los Angeles communities today, largely because of the time that he devoted to mentoring those around him,” said Omatsu.